Super happy to share my finished 'Spell It With Fabric' quilt top today! I've really enjoyed making this quilt, choosing all the bright and fun fabrics. My IG friends have been following along my block updates with the #spellitwithmoda hashtag. For the filler blocks I chose to do some fussy cutting from a cute animal printed linen fabric I got from Etsy, a million moons ago - and a brown Lecien print which is one of my all time favourites. I actually finished the blocks over a week ago, but only sewed the top together this morning as I was procrastinating about the sashing… I thought I would do scrappy sashing in a mix of low volume prints, the same as the letter backgrounds but having it laid out next to the blocks, it looked a little too busy so I went with Kona Snow. I set mine with 2.5" borders, as apposed to the wider border measurements given in the setting instructions by Moda as I wanted it smaller. It measures about 55 1/2" x 60". If you fancy making this quilt as well you can find the free pattern available as part of the Spell It With Fabric blog hop via the Moda blog. Next up I'm planning a 'J' mini for my sewing room wall! ;-) because I need another one. OK.
wow ! this is lovely and you've done it so fast . it looks beautifully crisp and clean and very colourful. you are quite the expert. It is ADORABLE and completely perfect Jessie!!! Oh, I love this! I'd like to make one for my daughter ... one day ...! Your version is really beautiful! 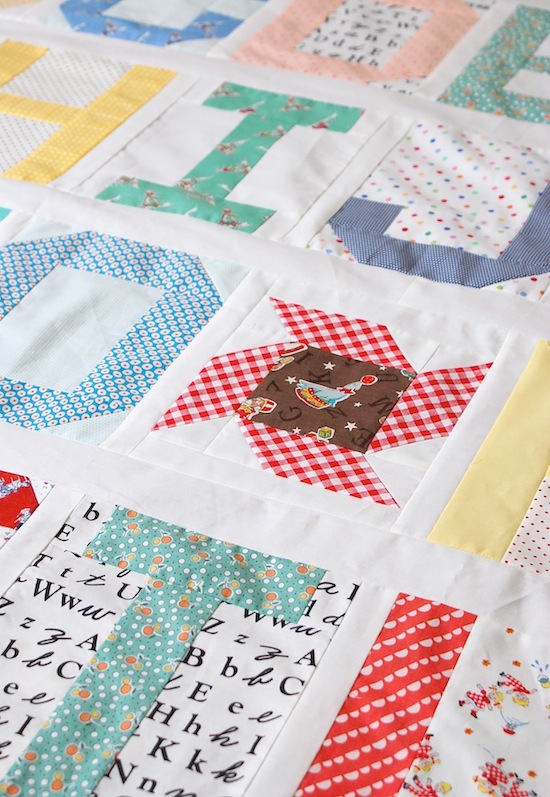 Love your fabric choices...this is such a sweet quilt! Just gorgeous... love the colours and fabrics! 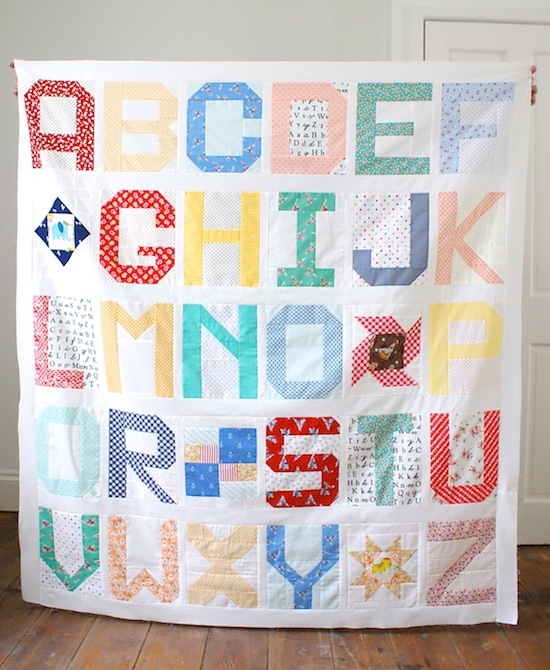 Where can I get the pattern to make this quilt, it is adorable! Thank you.